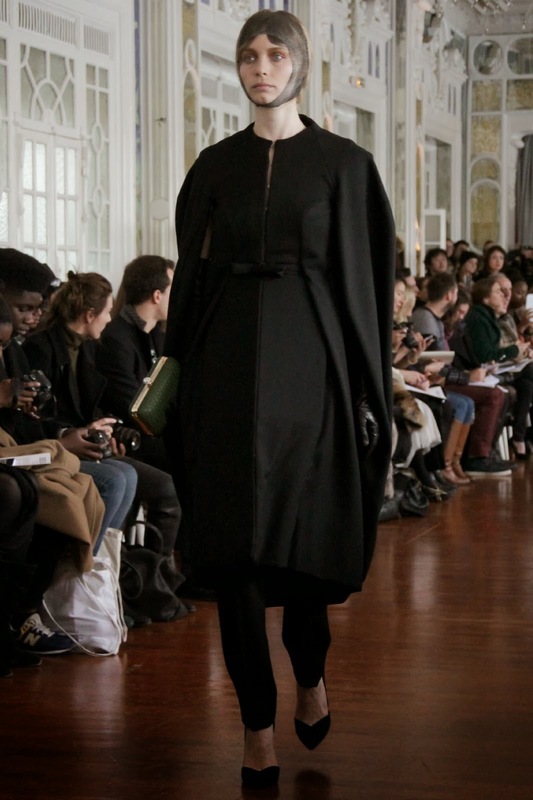 Corrie Nielsen brought strength and courage a woman can possess to her Paris official début collection for Fall/Winter 2014/15. Black was shown in many numbers in the collection. However, creamy gold and silver were the cameo and the closure. It seemed like it's colour of brightness, but what I captured during the show, there's supple sensitivity in there. 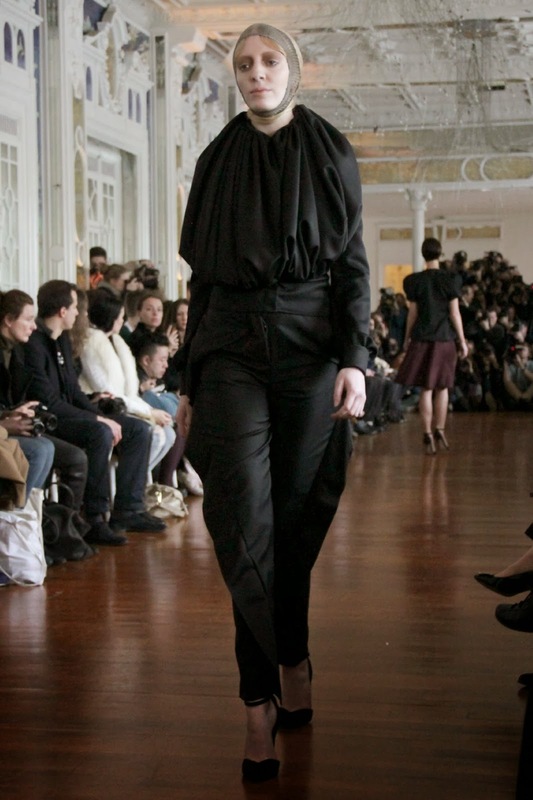 Sleek tailored trousers with bias cut was there. 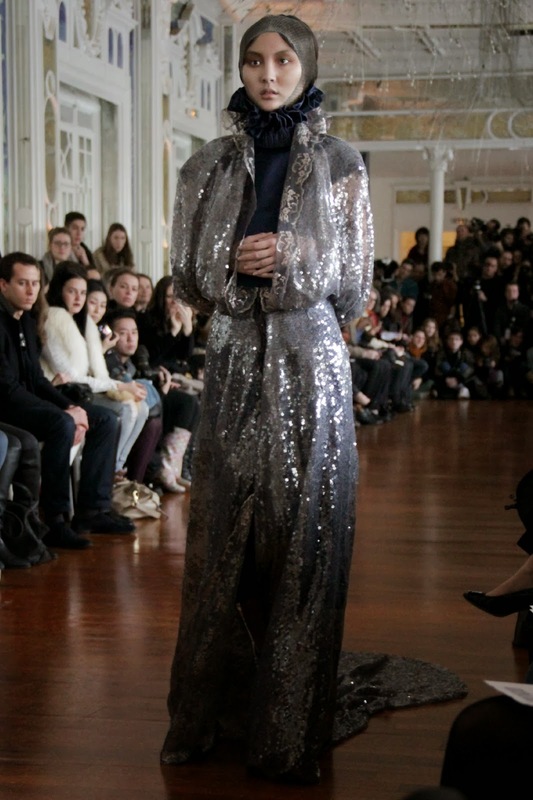 A dress with silver sequins all over it was there, so intricate that the model needed a help from the guest to walk through. The silhouette offered even more drama. With many looks offered a manipulation of women's shape, it was where the effect took over. Round bold shoulders, cocoon coat, baloon-esque skirt with lace and embroidery detail were the show stopping looks of the collection. A teathrical shape of peplum with a lot of well structured layes and stages, every piece of it was carefully arranged like a bouquet. Every model's head was wrapped with hair harnet, then it was wrecked to unveil the beauty of the facial features. 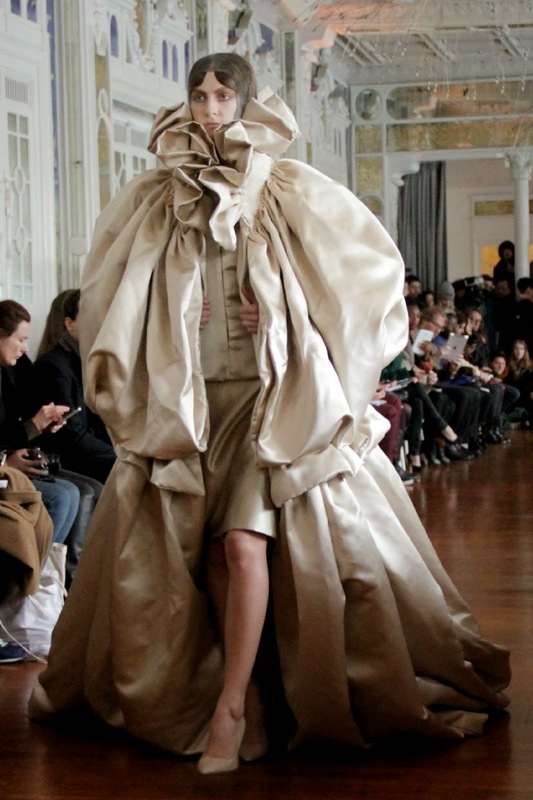 The finale, a gargantuan cloud coat with rose gold tone, which I imagine it'd take a village to construct, was breathtaking. It was so big it barely fit the runway. It even grazed my feet. 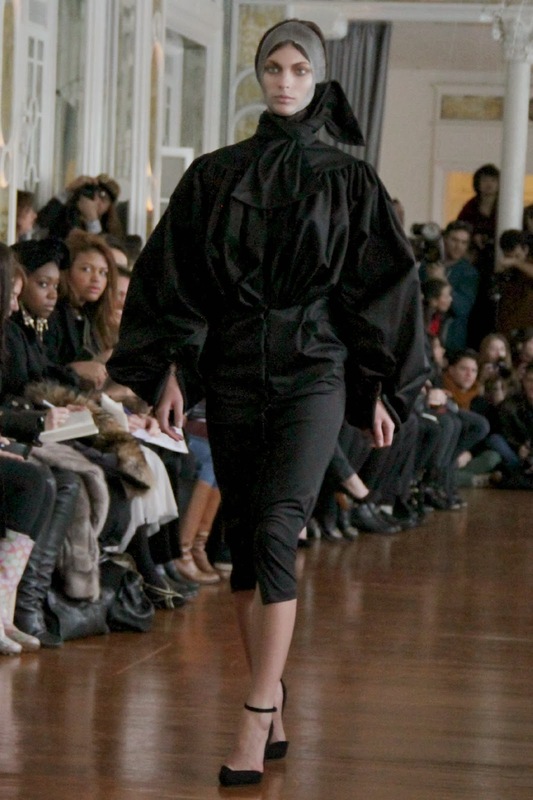 The model walked in calm. And even the music went slowly. The old school vibe was definitely there, made stronger by the slow, seductive way in which each of the models moved through the room, often twirling at every turn. Très magnifique. Darkness was all over the places. But it's not kind of darkness you're afraid of. It's like when you're scared to fall in love again. The contentment of sexual desire of Bram Stoker's Dracula, inspired by the Prince of Wallachia, Vlad III, Corrie explains further at backstage "It's the love and the lost". It was perhaps where the power came from. Struggle and desperation could be a source of something magical, something strong. Old proverbs used to say that people can, and should transform their weakness for the win of success. How? They work ten times harder than other people, thus they acquire a certain amout of value that noone else could obtain. Woman has been challenged through the ages, and there are many qualities in woman that a man can never have, and therefore never understand. When you were asked about a strong woman, you might imagine a woman with super power or hero. Or maybe, some people would propose their mothers to be one. Some, look inside, finding the answer of the question within self. What Corrie did was brilliant, yet definitely not easy; translating what a woman can conquer into work of art, and, with all what people say as weakness-sensitivity, tumultuous emotion, and fragility-, she freed herself from all boundaries. 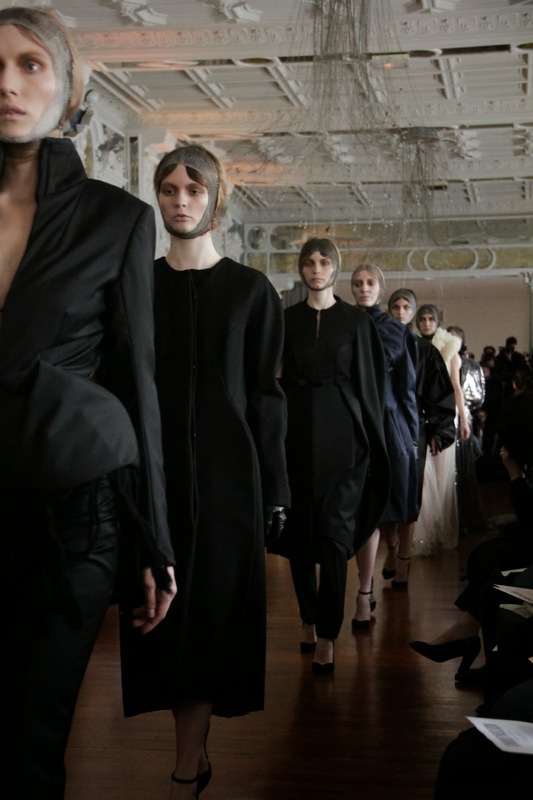 This collection is the epicentre of her hardwork, idealism, and surprisingly, romance. It is a mystery, the creation, the birth, and the existence of human existence. Hence it's a myth. And Corrie's attempt to deliver the idea of it through an ever growing imagery of a woman-with all aformentioned nature-with intricate execution of garment construction was an ambrosial act. One word? Enchanting.